Order Zebra’s new MC9300 at a demo discount! 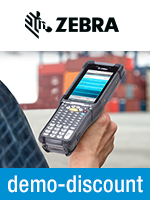 Zebra presents its new robust mobile computer with a 67.5% discount* on demo devices. The MC9300 outshines its predecessor and ensures for happier faces, better processes and more productivity for your customers in transportation, warehousing and logistics. 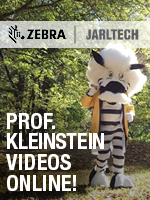 Have a look at www.jarltech.com/ TC20_TC25_Kleinstein/ to see the funny clips that we filmed for the Zebra TC20 and TC25 mobile computers - tested by Prof. Kleinstein! You will learn that the »Return on Investment« is already inside the TC20, and that neither elephants nor clams could possibly be this mobile computer’s target group. Be amazed at how Kleinstein tests the robustness of the TC25, using highly unusual methods. Or, when he realizes that the TC25 is one of the biggest bangs in history (after those mushroom heads from Liverpool, that is). And laugh out loud when he gets annoyed that the TC25 is constantly ready for operation, thanks to the PowerPack and 4G VoLTE. We hope you like watching the videos as much as we did filming them. If so, please share them! All bills of delivery for goods shipped by us to your customers are furnished with your logo and business information. If you have questions about the design, the data formats, or data transfer, please call us at +49 (0) 6081-600 200. We will gladly assist you.